Welcome to the Bremerton Chamber of Commerce and Visitor Center Website! 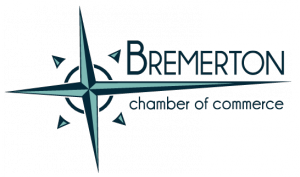 The Bremerton Chamber of Commerce promotes member businesses and provides leadership to enhance a positive business environment. We are an association of businesses, focusing on facilitation, advocacy, education, and communication. Our Visitor Center is located in the heart of Downtown Bremerton, stop by and visit us!